There is little information about this pattern. This marigold compote was identified as Flower & Diamond and made by U.S. Glass at the 2003 auction where it sold for $55. The base and stem are hexagonal with daisy-type flowers around the bottom of the bowl and a band of diamonds around the rim. 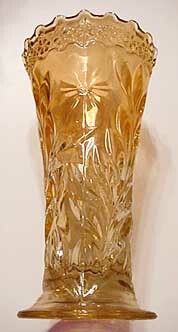 In 2004, Lance Hilkene sent this photo of the 10-inch vase with a 4 1/4-inch base in the same pattern. He also owns the compote. 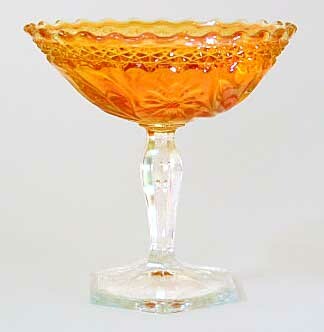 In 2005. a marigold 6-inch compote sold for $20.